If you are looking for information on the 1-800-DryClean franchise business opportunity, 1 800 DryClean franchises or 1 800 Dry Clean franchising, then you have come to the right place. Enjoy the timesaving convenience of 1-800-DryClean and eliminate those last-minute trips to the cleaners. Fresh, clean clothes - Guaranteed! Take a few minutes now and follow our two-step process below to find out what all the excitement is about! Time saving services are in demand and convenience is king. Today's busy consumer would rather avoid the hassle of going to the cleaners. When it comes to dry cleaning service, 1-800-DryClean has the answer. To have quality dry cleaning delivered to their door, customers simply call 1-800-DryClean and then they are connected directly to YOU. 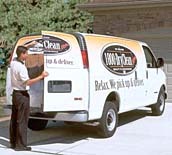 The 1-800-DryClean pick-up and delivery business will allow you to capture the market and dominate your area. When customers call the memorable 1-800-DryClean phone number for service, they are instantly connected to you. Customers can also easily find you on the 1-800-DryClean Web site. Our proven micro-marketing system allows you to build your routes sytematically and efficiently. A large component of the business includes the use of technology. Service Brands International has displayed a track record of applying award winning software technology. The 1-800-DryClean business management software system saves you time and effectively allows you to manage every aspect of your business. We help you establish a mutually beneficial working relationship with a quality drycleaner in your area to do the actual cleaning. After your first year in business, if you have the desire and the resources, we will help you purchase your own dry cleaning plant. Whether you own your own plant or maintain a partnership with an existing drycleaner, the 1-800-DryClean system promotes enhanced quality control and standards to ensure customer satisfaction. There is nothing in the dry cleaning industry today that more comprehensively addresses the exploding consumer demand for timesaving "to-your-door" services better than 1-800-DryClean! With 1-800-DryClean, YOU make the decisions, but you make them within a proven framework that takes many of the risks out of being in business for yourself. The 1-800-DryClean business model includes our exclusive 60 day RIGHT START program designed to do exactly that; get your business off to a right start. Formal training includes five days at our home office in Ann Arbor, Michigan, followed up with five days of field training at your location where we actually help you find a dry cleaner to partner with and assist you in signing up your first customers. You'll always be in close contact with your home office team to help you grow your business through our toll-free lines, electronic network, national conferences, intranet site, conference calls, and publications. There are no shortcuts to building a long-term business. For your investment, we provide a system and business format that will differentiate your business in the marketplace. You bring the necessary spirit, drive, and determination needed for your success. Together, we will make a great team.